A Wall Street Journal article Wednesday stated that, “Hog prices have surged in recent weeks on signs that Chinese buyers have turned to the U.S. to make up for the dwindling of China’s pig herds because of African swine fever.” Today’s update explores this development in greater detail. A report earlier this month (China- Livestock and Products Semi-annual) from USDA’s Foreign Agricultural Service (FAS) stated that, “African Swine Fever outbreaks continue in China, affecting all aspects of the swine and pork industry. China has reported 115 ASF outbreaks to the World Organization for Animal Health (OIE), covering all commercially significant swine producing regions. While it is still unclear if ASF outbreaks will continue to be reported with the same frequency and geographic distribution, the disease has already taken a toll on China’s swine and pork production for 2019. By the end of 2019, the total swine inventory will be down 13 percent to 374 million head. Pork production will decrease by 5 percent to 51.4 million metric tons (MT), with the reduced supply only slightly offset by weakened demand. The FAS update noted that, “Chinese imports of U.S. pork were down by nearly half in 2018 as China’s government levied retaliatory tariffs on most U.S. agricultural products, including pork. With an additional two tariffs, most U.S. pork now faces a 62-percent tariff, versus the MFN rate of 12 percent. While the United States is well-positioned to supply the Chinese market, the additional tariffs will continue to constrain opportunities. 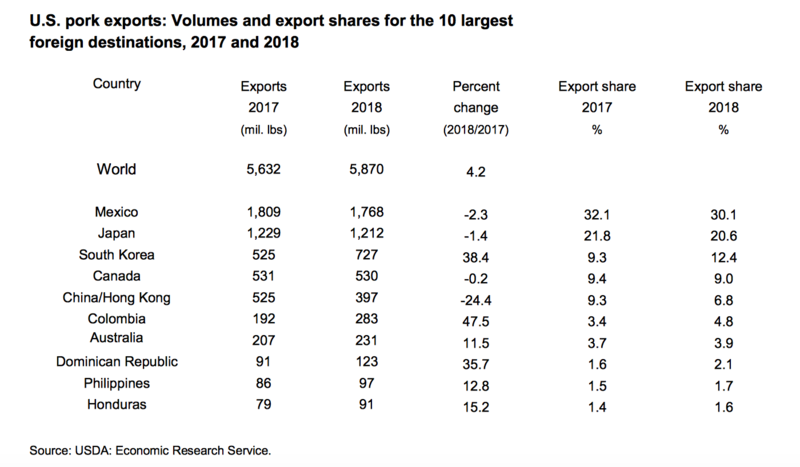 Also this month, USDA’s Economic Research Service pointed out in its Livestock, Dairy, and Poultry Outlook that, “Major foreign destination for U.S. pork exports in 2018 are summarized [in the table] below. 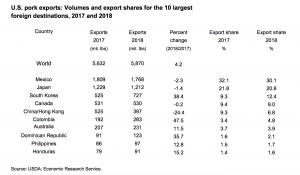 It is notable that Mexico, Japan, Canada, and China/Hong Kong all accounted for a smaller share of U.S. pork exports in 2018 compared with a year earlier, while the reverse was true for South Korea, Colombia, Australia, the Dominican Republic, the Philippines, and Honduras. Wall Street Journal writer Kirk Maltais reported on Wednesday that, “U.S. 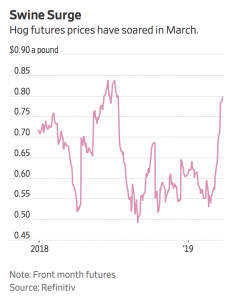 hog futures prices have rocketed nearly 50% higher in the past month, as expectations rose that China would use American imports to cover shortfalls in its pork supplies. “U.S. Hog Futures Soar as China Continues to Fight Swine Fever,” by Kirk Maltais. The Wall Street Journal (March 27, 2019). 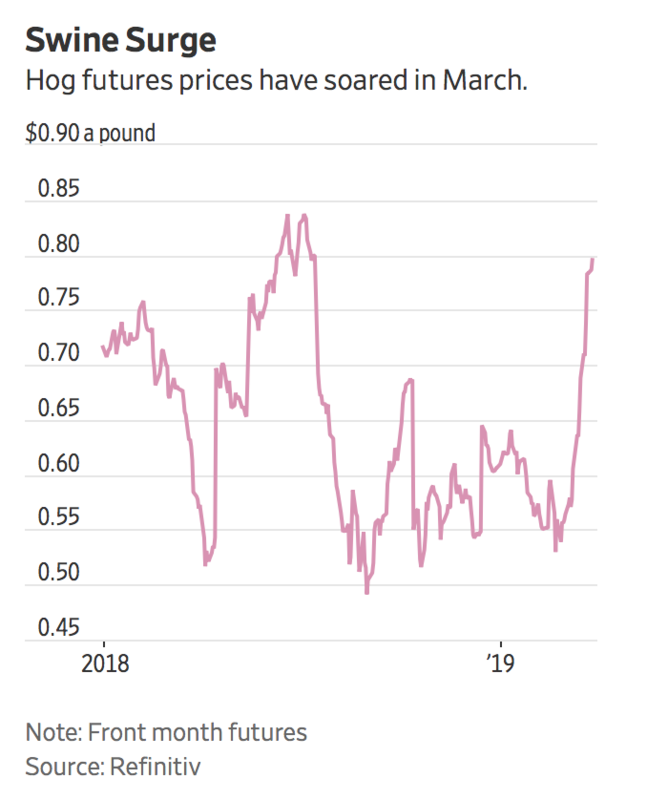 “Hog futures are one of the best-performing markets this year—just behind gasoline and U.S. crude—across commodities, stocks and currencies. The broader S&P GSCI commodity index has climbed 16% in that period,” the article said. Hog prices have surged in recent weeks on signs that Chinese buyers have turned to the U.S. to make up for the dwindling of China’s pig herds because of African swine fever. Outbreaks of the disease, which is deadly to pigs but not harmful to humans—started last year. In addition, the Journal article noted that, “The livestock futures market was abuzz this week about even bigger U.S. purchases in the coming weeks. According to a Bloomberg report, Chinese officials are considering buying up to 300,000 metric tons of pork from the U.S. in 2019, two-thirds of which could be purchased in the first half of the year alone. 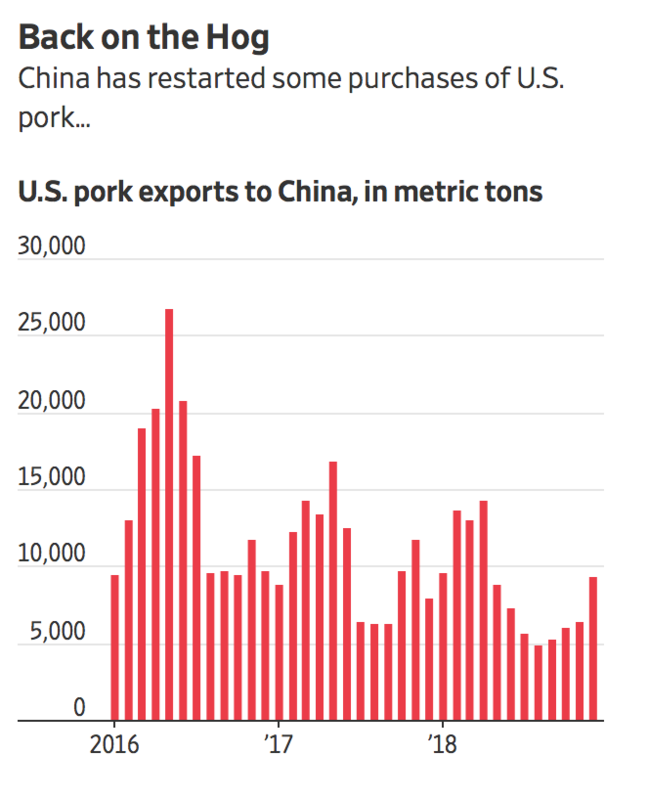 That would be a stark reversal from last year, when Chinese pork imports from the U.S. plummeted 47% to 29,600 tons as trade tensions between the two countries intensified. 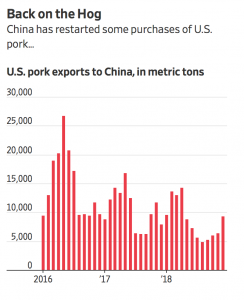 In a separate Wall Street Journal article Wednesday, Kirk Maltais and Jacob Bunge reported that, “A deadly virus that has decimated Chinese hog herds has prompted buyers in the world’s largest pork market to purchase more of the meat from U.S. producers for the first time in a year. “Officials Step Up Swine Fever Checks to Protect U.S. Hog Industry, Market Rally,” by Kirk Maltais and Jacob Bunge. The Wall Street Journal (March 27, 2019). If this [African Swine Fever] gets in the United States, it’s going to put us out of business. Are we on the ball here? Sec. Perdue stated that, “Well, I think we are. But there’s no doubt, in these kind of transmissible diseases and the mobility of society today, there’s no way to guarantee that Mr. Chairman. But I think APHIS, our Animal Plant Health Inspection Service, is on the job at borders. Working hand in glove with our customs and border patrol, using obviously dogs, rescue beagles, in order to sniff out incoming travelers from internationally, particularly in those areas that we fear.